Ionode is Australia’s preeminent and most respected manufacturer of electrochemical sensors and invites you to try our disk voltammetry electrodes–expertly made to exacting standards using the finest of precious metals (99.99+%). Manufacturing since 1972 and experts in Eh (ORP) sensor development, Ionode Echem sensors have a solvent-resistant PEEK body (65 mm length x 6 mm OD) which is embedded with highly polished disks of various electrode materials (premium quality glassy carbon, gold, platinum or silver). The electrode disk diameter is either 3.0 mm or 1.0 mm and they are safe to use in most common solvents such as acetonitrile, dichloromethane, THF etc. Ionode also offers custom fabrication of voltammetry electrodes to your specification. Please contact us for more details. A gold coated metal pin (7.5 mm) is used to connect these electrodes to an appropriate instrument using an alligator clip. Each electrode comes with a silicon O-ring which fits snuggly on the PEEK body, which is useful for changing the depth of the electrode mounted in a voltammetry cell. Surfaces are micropolished to a mirror finish and easily maintained with the Ionode polishing kit, which is sold separately. All Ionode electrodes have been individually quality tested before dispatch and carry a limited 12 months replacement warranty. 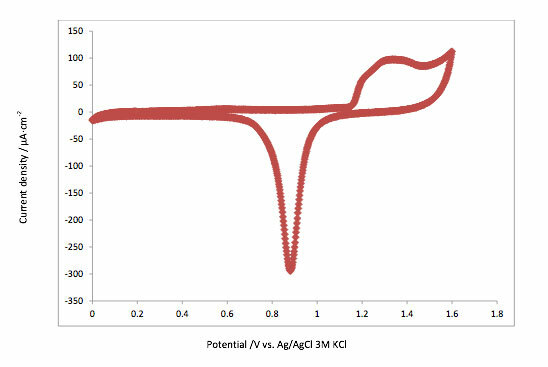 Typical cyclic voltammogram for Au electrode in 1 M H2SO4. Ionode gold disk electrodes are designed to be used in a range of voltammetric experiments. The gold disc is polished to a mirror finish. Ionode gold button electrodes are designed to be used in a range of voltammetric experiments. The platinum disc is polished to a mirror finish. Reference Electrode - Aqueous Ag/AgCl Refillable - Simple screw top makes refilling quick and easy.